Well, I took the last step in my cancer treatment today. Or my second to last step. I have filled my prescription of Tamoxifen. This is the drug I am supposed to be on every day, for the next five years. 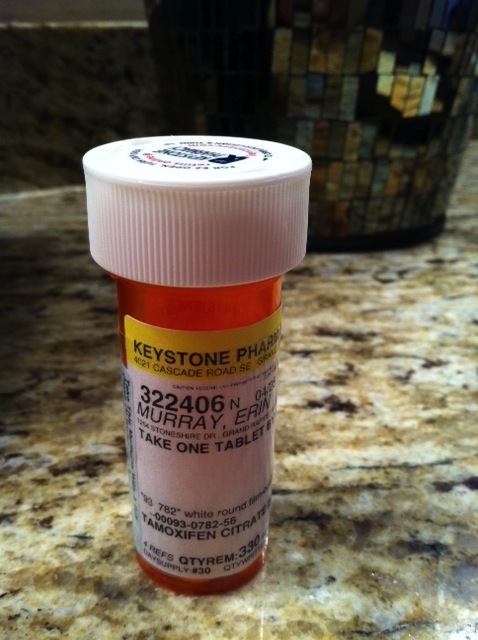 This is the drug that has the potential to lower my rate of recurrence by 30%. This is also the drug that can put me into early menopause (hello hot flashes) and prevent me from having another baby. The conversation with my surgeon this week made me realize how critical this little pill is to my treatment and future health. My good friend, Rita Rivard, a RN that I met through Komen, supported that same message today. The logical side of my brain also knows that I need to have this drug if I want to be my healthiest self. But I've had to do a lot of mourning and a lot of grieving this week. Brian asked my why having a second child is so important to me, when I am already blessed with the one I have. I feel that I need to explain this position because not many people understand. Evan is a blessing - the most wonderful, awe-inspiring child I could ever imagine. He saved my life and brings smiles to me everyday. I cherish the moments I have to rock him to sleep (when he will let me) and adore the fact that he crawls over on the bathroom floor and tugs at my pajama pants while I am getting ready in the morning. This has nothing to do with not loving Evan with every part of my being. It has to do with loving my siblings. I want Evan to have a Meghan and Bryan to love and cherish. I want Evan to have that person to complain to about Mom and Dad. I want to know that if something happens to me, Evan will always have that brother or sister to lean on. I know that Evan has Gavin and Cohen; the relationship the three boys has is amazing. Gavin and Cohen are such wonderful older brothers and adore Evan. I couldn't ask for a better situation. But Gavin and Cohen come as a pair - and they leave as a pair. They are away on weekends together and away on some family vacations without us. They will be in middle school and high school together. I know they will always love their little brother, but Evan deserves someone around all of the time. He deserves my Meghan and Bryan. And selfishly, I want two children to love and hold. I want a big, fat family that loves to spends weekends at our house. I want kids coming over after every football game and for pictures before Homecoming. I want Evan to feel like he is the most cherished in the world; along with his little brother or sister. So, I have grieved about letting this dream go. Certainly, I may be lucky and be able to get pregnant. But five years is a long time and I'm not sure how I will feel about a baby when I have a fourteen year old, twelve year old and six year old in our house. My dream of having two kids within a few years of each other is not my reality anymore. The Tamoxifen is in my bathroom. I stupidly tucked it in the bottom drawer in the back of a bunch of stuff. "Out of sight, out of mind"? I know it's there and I know I have to take it. But I'm not quite ready today. Maybe I will be tomorrow and maybe it won't be until next week. But it's in my future; just not the future I imagined. Great post, Erin. It's really tough to let go of dreams, or believe in some greater "plan" when you are wading through muck. Keep on keepin' on. Also, Giuliana got a surrogate! #inspirational (Granted, I know those are super expensive but maybe you will win the lottery; Tamoxifen can't stop you from buying lotto tickets! ).